From the Gallo-Roman period and up until the XVIII century the Peninsula was limited in the south by the rue des Remparts d'Ainay and the rue Bourgelat and in the north by the Terreaux. Today, within the boundaries of the World Heritage site, from north to south, the Peninsula includes the districts of the Terreaux, Saint-Nizier, Cordeliers, Grolée, Jacobins, Bellecour, Ainay and Perrache. This sector of Lyons contains some of the most interesting architecture from the XVIII to the XIX centuries. In the V century, the Burgundians invaded Lyons and made it one of their capitals. The town progressively depopulated but enjoyed a slight population increase at the start of bridge building in the XI century. From the VI to the IX centuries, the town lost its political importance, saw its population decrease and became a rather deserted territory. In 1077 the Saône bridge, called 'pont de Pierre', revitalised the Peninsula. Its name was changed to the pont du Change and it stood where the actual place du Change and the Saint-Nizier church are. It was destroyed in 1843. Around Saint-Nizier and the rue Mercière merchants and craftspeople set up their businesses and houses were built. In the XIII century a solid bridge over the Rhône allowed the town to develop and increase its exchanges with Italy. From then on economic power was concentrated in the Peninsula whereas the right bank of the Saône maintained its religious power. At the Renaissance, at the beginning of the XV century, and thanks to its fairs, Lyons progressively took on its European importance. The Italians, masters of new payment means (exchange letters), vitalised economic exchanges and activities of the city thus making it a cosmopolite centre which attracted large numbers of German and Spanish people. 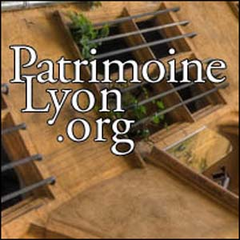 From 1743 onwards, as a result of Barthélémy Buyer, the printing industry began to develop which also contributed to the Peninsula’s dynamics; in 1500 there were 50 printers in Lyons. In the XVI century the silk industry took off: on the Peninsula, at Saint-Georges on the right-hand banks of the Saône and then later on the slopes of the Croix-Rousse. This was the period known as the great textile age, the "Grande Fabrique", which lasted until 1880. And the roads gradually became wider, radically transforming social life in the sector. These large works ended in the Second Empire with the urban planning of the Department chief VAÏSSE.